In March, my family came all the way over from the UK to visit me! I was so happy! We stayed in Kyoto for over two weeks. As we were in Kyoto, the first place I decided to take them had to be Fushimi Inari Taisha. When I went to Tokyo in March, Marcus and I went to a hell of a lot of places (Shinjuku at night// Kamakura// Metropolitan Government building// Shibuya and Meiji Jingu// Harajuku), and where we stayed was absolutely perfect. After Shibuya and Meiji Jingu, we continued on to Harajuku. We braved Harajuku on a weekend but honestly, if you can I'd recommend going during the week. It's pretty crazy at weekends. (Mostly tourists too tbh). We got crepes, and I went into some awesome shops like Nadia Flores en el Corazón, (me), 6% doki doki (unfortunately you're not allowed to take photos inside, so you'll have to see for yourself), and G2? The Metropolitan government building in Tokyo is on every list of 'things you must do in Tokyo' and not without good reason! I honestly can't believe you can get such an awesome view for free! If you're in Shinjuku I'd recommend visiting so much. Side note: there is also an awesome souvenir shop up there with every pop culture thing ever. I'm just starting back at uni, and that means correcting my nocturnal sleeping habits into something a little more reasonable. Setting a good morning routine is the easiest way to make sure your day goes right, so here's a couple of tips on how to get the best start to your day possible. Apparently it kick starts your metabolism, and it's also good for your skin. Bonus points if you chuck a lemon in too. Set your alarm later, when you know you can't snooze. Uninterrupted sleep is better, and then when you wake up, you know you have to actually get up. (Tbh my bag is almost never unpacked because I keep the same bag) This means you won't have a morning scramble for your keys.You could maybe even pick your outfit the night before. it will make you feel so much better as your body will get used to it. Do you have any tips for mornings? I'd love to know! The day after our walk in Shinjuku, Marcus and I headed to Kamakura. Kamakura is a town in Kanagawa Prefecture that is sometimes called 'The Kyoto of Kanto'. It's a really nice day out! While obviously it doesn't have quite as much to do there as Kyoto, that might actually be a point in it's favour. Kyoto can be a little overwhelming sometimes, and it's packed with tourists (I still love it though). Kamakura has a more relaxed feeling, and the Daibutsu was the only place that was overflowing with tourists. I'm sure it does get busy at weekends though. Kamakura is about an hour and 1000 yen away from Shinjuku, so it makes a really easy day trip from Tokyo. This is the one thing that is pretty much non negotiable- the Daibutsu is a must see and is probably the most famous place in Kamakura. The entrance fee was only 200 yen, and for an extra 50 yen you can go inside the Daibutsu statue itself, too. Kamakura has two main beaches, Yugihama and Zaimokuza. The one I went to was pretty, and the view was really nice there. I bet they are so crowded in summer though! Hasedera was definitely the standout part of the day for me. It's a temple that's a short walk away from the Daibutsu, and boasts a gorgeous garden with an amazing view of the sea. There was also a cave you could go in! Entry was around 300 yen. Hachimangu is a huge and impressive shrine with a great view of Kamakura and the road leading up to Hachimangu from the top of the shrine complex. When we went, they were just about to complete work on the road, so it should now be lined with trees and lanterns. Enoshima is also meant to be well worth a visit. Unfortunately I didn't get a chance to go, but it's a small island close to Kamakura. You can get there by the Enoden tram. Kamakura also has a tonne of good hiking trails which we wanted to go on, but unfortunately ran out of time. Or check out the Japan tag for everywhere I've been this year so far. I've been to Tokyo twice recently, once in the spring holiday and once in Golden week. Talk about busy, eh? So I have a tonne of Tokyo content coming up. It's such a vibrant and cool city, and I managed to do loads while I was there. The first day I arrived in Tokyo, Marcus and I went for a little walk round Nishi Shinjuku close to where we were staying, and also had a little walk round Kabukicho too. I saw the iconic 'love' sculpture, the Metropolitan building and some really cute Hello Kitty roadworks. I thought they were so awesome, and they were actually used for the background of a photoshoot in the latest issue of Vivi (one of my favourite fashion magazines). Anyway, it was such a cool area to walk around! I wore this outfit to Amemura the other week when me and Emily went shopping. Oh April... where did you go? The Sakura tree at uni is covered in new green leaves now, and the weather is heating up too. Last month just whizzed by: I've started back at uni, and although I've got less work than last term (for some unexplainable reason I decided to take 20 credits instead of 15...) I still have a fair bit to do. I've also signed up to the JLPT (Japanese Language Proficiency test) Level N2 so I need to get studying for that... wish me luck! 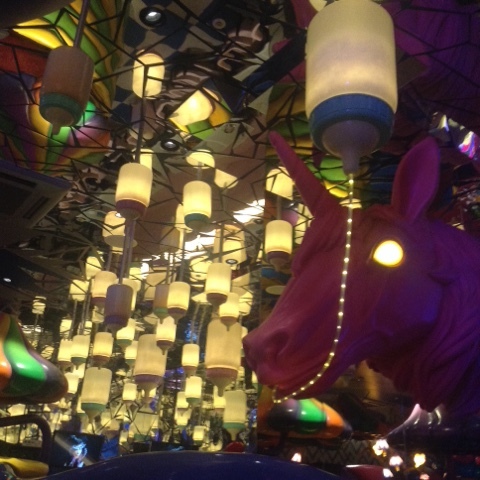 I went to loads of different places, like Nakano Broadway and the Kawaii Monster Cafe. (it was beyond amazing) I'll blog about that soon hopefully! 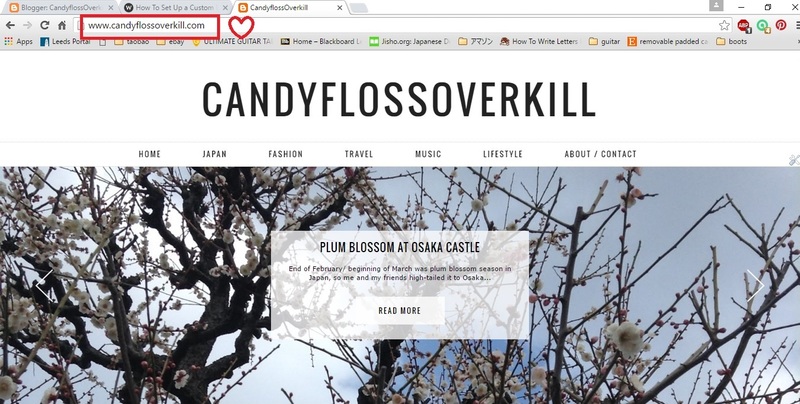 I finally bought a domain for my blog: you can now view this on Candyflossoverkill.com!! I hit 300 posts! It seems crazy that I'm writing so much lately! Make sure to check out the archives if you've missed any of them, hehe. I also just finished writing up the trip I went on in February with Marcus! And of course, I wanna keep up with the daily blogging hype that I've got going! Don't have one? Start one! Gratitude journalling is proven to make people feel happier, so go! It's also a convenient excuse to buy ALL THE STATIONERY. or listen to an audiobook. Time away from a screen is a rare commodity these days. It will definitely wake you up and make you feel good. Get outside and go for a walk. Touch typing, calligraphy, anything. Even try learning a language! Try your hand at something arty. Pinterest is your best friend. Weekend plans, travel, or arrange to see that friend you haven't seen in forever. Or, if it's late-ish, go have an early night! Thanks for reading! What do you like to do in your 'dead' time?